Of all the fashion accessories of the 1950s—Ray-Ban sunglasses, Pucci scarves, Eisenberg cocktail rings—none were more dazzling than Lucite handbags. These geometric gems, which in retrospect seem to anticipate the exuberance of the 1960s, were like portable jewel boxes turned inside out, in hues that ranged from basic black to pretty pastels to clear. Some purses were made of laminated Lucite, sealing butterflies, raffia, and multi-colored confetti within their rigid plastic sides. Others were studded with rhinestones, or even hand carved, using techniques handed down from the ivory trade. One of the foremost authorities on Lucite handbags is Janice Berkson, proprietor of a vintage jewelry and handbag shop called Deco Jewels in New York City. Her book, “Carry me! 1950’s Lucite Handbags an American Fashion,” published by ACC Editions, with eye-popping photographs by John Bigelow Taylor, is an invaluable guide to this art form. Berkson has had her own invaluable guides to hard-plastic purses. The first is writer and editor Robert Gottlieb, whose “A Certain Style, the Art of the Plastic Handbag, 1949 – 1959” was written with Frank Maresca and published by Knopf in 1988. Gottlieb and Maresca’s book kindled Berkson’s love affair with Lucite. Above, a pair of laminated Lucite handbags by Wilardy (style #876 on the left, #750 on the right). At top, a Tiger clutch, lunchbox purse, and lipstick holder, also by Wilardy. 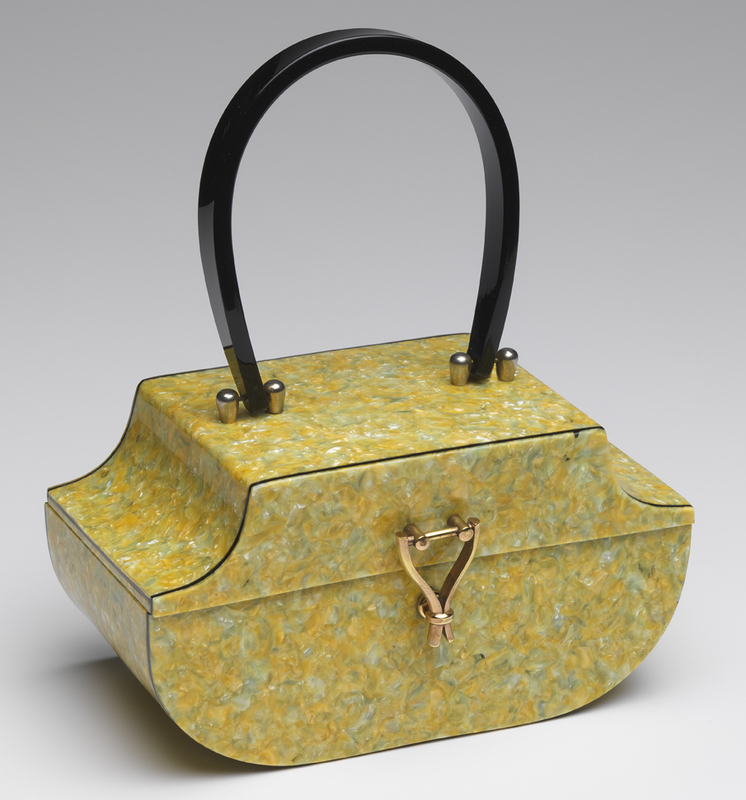 Llewellyn was known for its carved Lucite bags, as well as ones like this one made from shell, a hard plastic material composed of cellulose acetate. By 1995, Berkson knew what she was looking at. She knew, for example, that Hardy had first used Lucite in handbags while working for his father. His materials were salvaged from the damaged nose cones of airplanes that had been scrapped after World War II. Wilardy was not the only company working with Lucite. Associated Plastics, which made “shell” frames for handbags in 1946, soon began making handbags entirely of “plastic” under the name “Gilli Originals.” Another New York company, Maxim, was advertising its Lucite handbags as early as 1947. 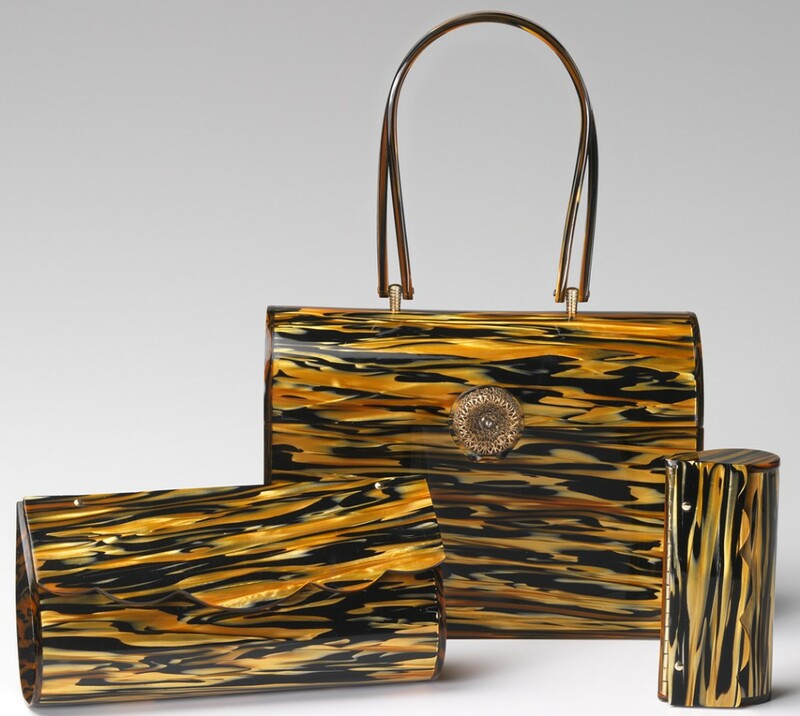 These rectangular bags were made in shell, butterscotch, white, and black. 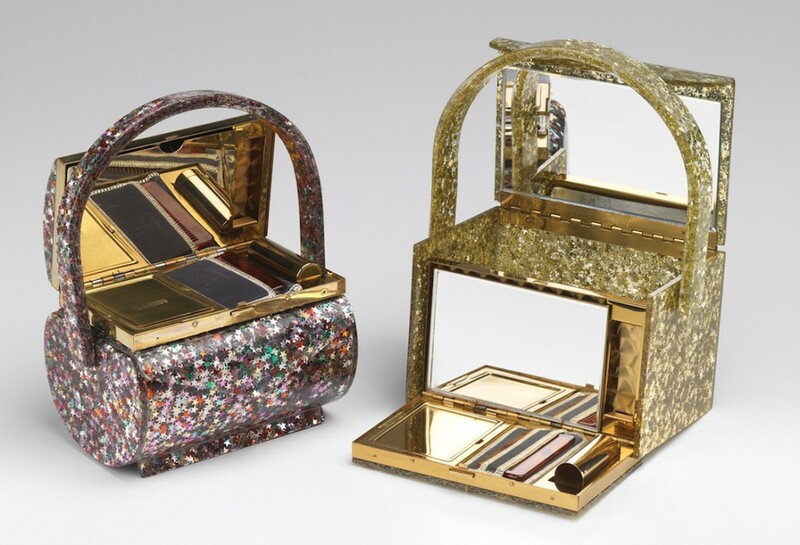 Vanity purses laminated with colored or gold glitter, such as these examples from Wilardy, were popular throughout the 1950s. 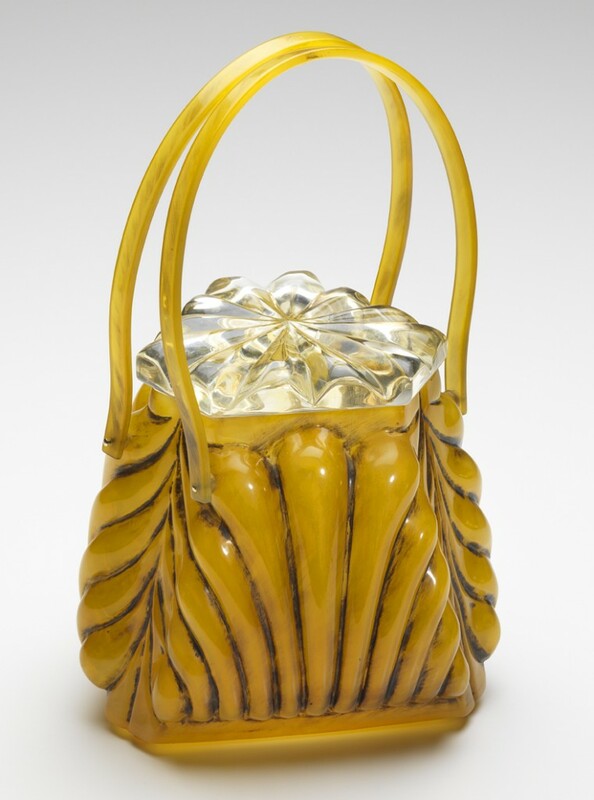 One of the most inventive of the early Lucite handbag makers was Llewellyn Bley, whose bags were carved to create Art Deco angled stripes or organic Art Nouveau designs. Llewellyn embellished its globe, basket, and pagoda-shaped bags with gold filigree, while one of its most famous bags, the Beehive, featured a lid adorned with a trio of brass bees. 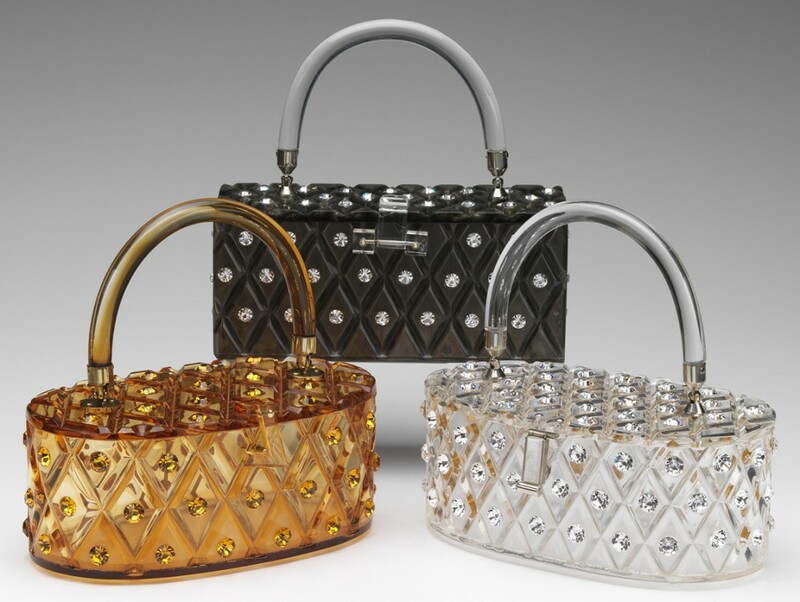 A trio of Maxim bags, each carved in a diamond pattern and dotted with rhinestones. Llewellyn also produced hard bags that seemed to be soft, such as the inverted-fan-shaped bag that sits on clear ball feet and whose sides appear to be pleated. Llewellyn’s Conestoga Wagon purse resembles a duffle bag that is taller at either end where it’s attached to a pair of twisted strap-like handles. Other manufacturers went absolutely nuts with color. 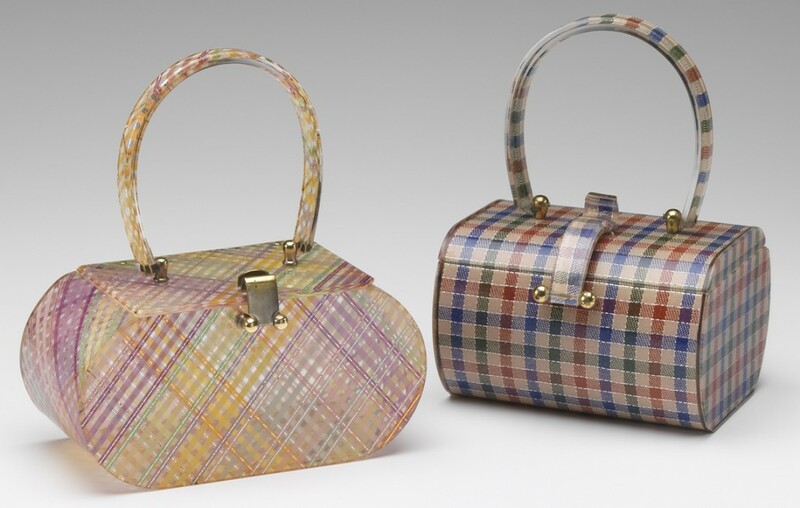 Wilardy made handbags that glowed green or lavender in the dark. Charles S. Kahn of Florida produced bags in the shapes of hat boxes, barrels, drums, and cylinders in emerald, cobalt, cranberry, raspberry, and gold satin-finish Lucite. Myles Originals, also of Florida, used a material called Lamoplex to create a crushed-crayons effect. This yellow and green “crushed crayons” bag was made of Lamoplex by Myles Originals of Florida. In addition to working with Lucite, Florida manufacturers were able to construct bags of cellulose nitrate, a plastic material that was illegal in New York because of its high flammability. This alternative to Lucite was used by Miami Handbag Mfg., Inc. in its Patricia of Miami and Bag By Benné lines—as if to prove New York safety laws correct, a worker using a dull electric saw on a brand of cellulose nitrate called Everplex started a fire that destroyed the plant. 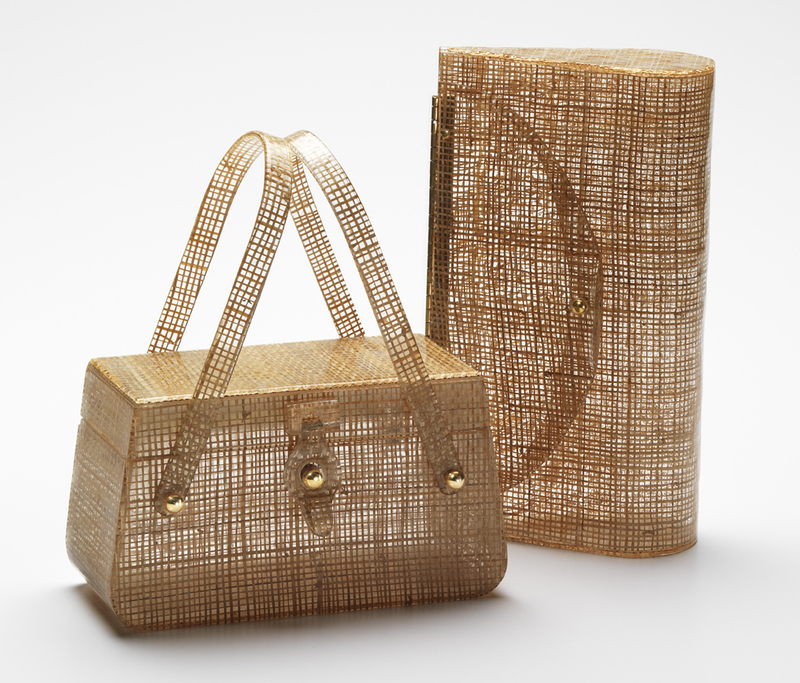 But the effects Lucite handbags are perhaps best known for were achieved by lamination. “In my opinion, Wilardy did that best,” says Berkson. Silver, gold, or multi-colored confetti and stars were favorite fillings to sprinkle between sheets of clear Lucite, as were gold and silver threads, which gave the bags an almost fabric-like appearance. Basket-weave fabric also softened hard edges, as did pastel plaids. Wiesner made rhinestone-trimmed “birdcage” bags in black and clear. The clear one reveals the matching accessories within. Some bags featured rounded see-through coffin-like lids with faux flowers inside. Other lids styles were designed to hold compacts, cigarette cases, and lipstick holders. And the shapes! There were triangles, parallelograms, hat boxes, convertible clutches, and accordions, in double- and triple-decker models, a specialty of Wilardy. Many of the Florida manufacturers secured their bags with a three-ball clasp, whose components were plated with 24k gold. By any measure, these were some pretty fancy handbags. Basket-weave fabric was a favorite Lucite laminate. The bag on the left is by Charles Foster, the clutch on the right is from Wilardy. In the 1950s, women would change the appearance of their clear Lucite purses by simply changing the scarf they tossed in the bag to hide its contents from view. 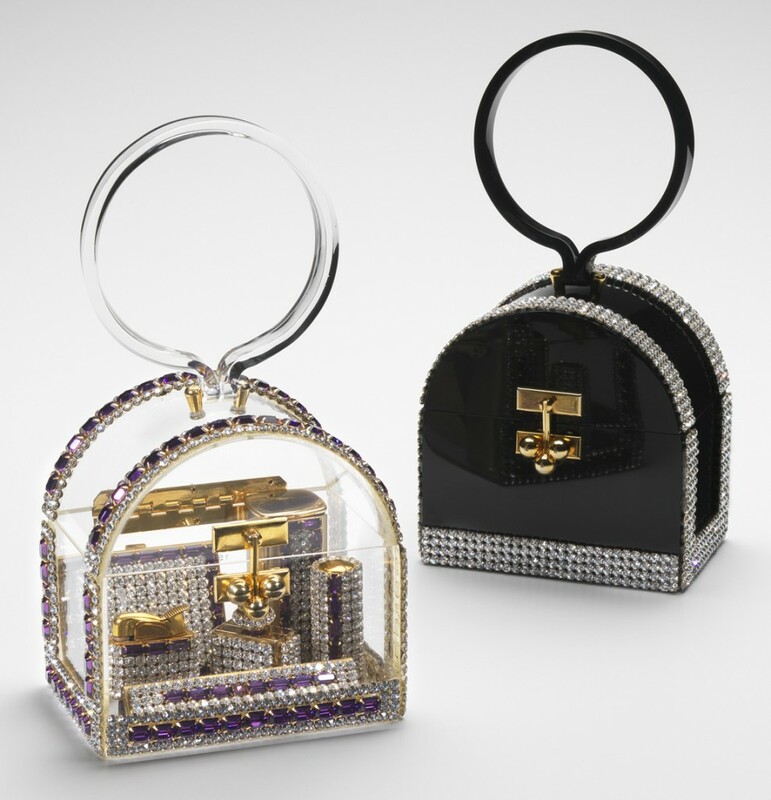 Thanks for the great article on lucite handbags. Reminded me of an earlier time in my life when I and other women actually carried them; mostly for dressey occasions. WOW! I want all of these most fab lucite beauties! Great article and thank you for sharing! i would like to know how you get the plastic purses to shine like new??? they are all beautiful. thank you. REMEMBER ROBERT PALMER’S SONG, “MIGHT AS WELL FACE IT YOU’RE ADDICTED TO LOVE” WELL MY SONG IS: “MIGHT AS WELL FACE IT YOU’RE ADDICTED TO LUCITE”, I LOOK ALL OVER THE INTERNET FOR COLORS PURPLE, AQUA, AND IF I COULD EVER FIND THAT HUNTER GREEN THAT THE QUIRKY FINDS LADY HAS, I’D BE IN HEAVEN. I JUST BOUGHT A BLUE AND A DARK GREEN BY MYLES (NOW I HAVE TWO MYLES). DON’T EVEN MENTION WIESNER BAGS, THEY ARE THE BOMB, LOVE THEM. DOES ANYONE KNOW WHERE TO FIND UNUSUAL ALL LUCITE BAGS? ANY STORES, THAT HAVE UNUSUAL COLORS. NOT ON THE INTERNET APPARENTLY, THEY ARE GETTING HARDR TO FIND! My father was Morty Edelstein the designer and head of Patricia of Miami…..Patricia was my mom……as kids we used to wander the factory…..I still have some plastic items from that time…..we used to keep crayons and toys inside the purses……this is a great web site…..thanks for the info. The Internet has ruined collecting these purses at any affordable prices. I used to be able to buy them for $7-10 back in the 80’s. but now I can’t afford to collect them anymore. I have about 10 lucite hand bags I would like to store for a period of time. I would like advise on what is the best way to store them. Thanks Leisa. 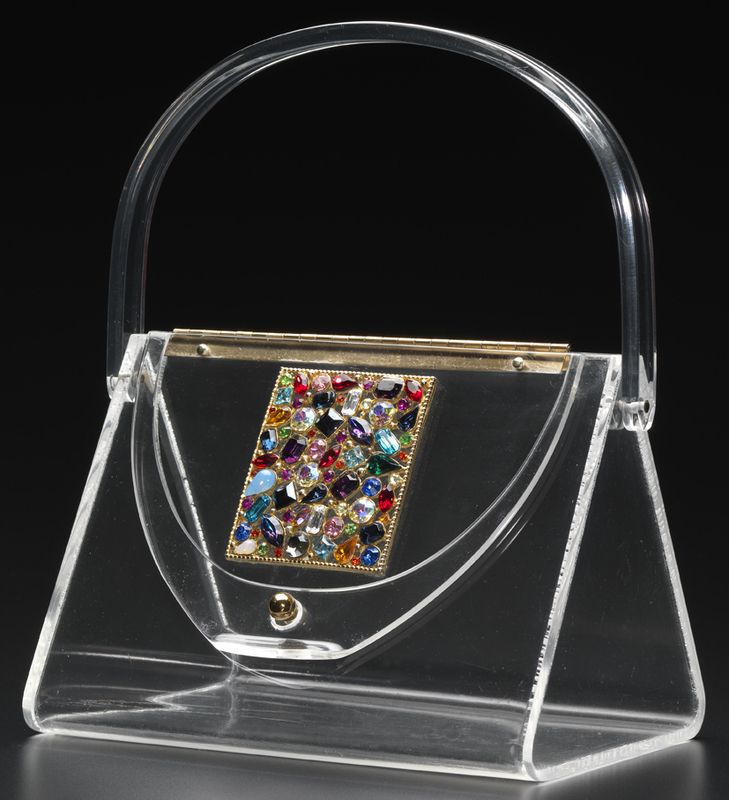 Ben, thank you for providing such a GREAT site for fans of lucite purses! A friend gave me a Wilardy (and two other lucite purses–I don’t remember the names) in the late 1970s. I hung on to the Wilardy, because it was the most beautiful one. I have been searching sites to find out what the name is of the model I have; I believe it is called a ‘Stardust’ pattern, but I have seen the same thing described as “Gold-Dust” and there is on similar called “Black Gold-Dust”. But the shape of mine is what you have marked as “#750”; do you know if that style has a particular name? Mercy, respectfully, I must disagree with your post. I don’t think “the internet has ruined collecting these purses at any affordable prices.” I have seen some selling for under $75 (which is pretty great for an antique). I don’t think anyone can expect to pick one up for $7-10 anymore; the same thing goes with ANY collectables. If anything, I think the internet (this site is a perfect example) has empowered the potential buyer/collector by giving them information that they may not have had. Additionally, through the internet one is able to find a purse that is incredibly hard to obtain. Will you have to pay more than $10 to buy one of these beauties? More than likely. Would you have been able to find one worth buying in the first place, if it were not for the internet? Probably not. What a wonderful article. Yes, Jan’s book is full of these and many more amazing photos. I’m always looking for these rarest of all Lucite bags. I have a huge collection of well over one hundred Lucite bags, as well as at least 400 other vintage purses. Some I’ll keep forever, but some are for sale on my website vintagepursepage.com. Janice is a legend with respect to lucite purses and vintage jewelry. She has a strong sense for the unusual pieces and ultimately collectable treasures. And if that wasn’t enough….she is an absolutely amazing person. Don’t miss the opportunity to visit Deco Jewels in NYC…..you won’t be disappointed. If Janice is not available……Evan will be more than willing to help you find anything that you simply love. They both have a great deal of patience and want you to leave happy with your purchase. Two of my favourite people in NYC!!!!! We moved from the Bronx in 1955 to Miami Beach, when my dad got a job with Morty Adelstein. I think Morty Adelstein was also my fathers best man, at the marriage of his first wife Pauline Markman in 1937. Pauline died in childbirth in 1938, and in 1940 my dad married my mother Ruth Korman. I guess my father lost his job when the plant burnt down. I remember he then took a job with another handbag manufacturer Eli Rosenberg. Things did not work out and we moved back to NY in 1962. I would love to have a contact email to Morty Edelsteis son, if he is still alive. We might be able to share memories. “ ” If the battery went dead, would you still want to wear it on your body?